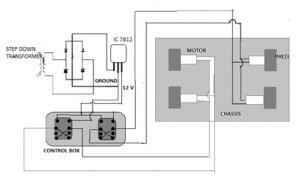 Power Supply : Your motors need a 12 V DC supply to run. If you are into soldering circuits yourself, you might want to make your own rectifier circuit (think back to your XIIth standard Physics textbook-Bridge Rectifier). Add an IC 7812 across the rectified output to get a stable 12 V input into your motors. Or else, just get an adaptor which gives a 12V DC output or a set of batteries. Control Box : This puts you in complete control of the bot. You need two switches for two motors. Now you could choose to use two three-way switches with forward, backward and stop conditions for each motor or 2 two-way switches in combination with push button switches that control the On-Off condition. Usually, for an autonomous robot, the front wheels are replaced by a castor wheel while the two back wheels are connected to motors. Now that you know all the steps, follow the schematic for guidance and build yourself your first robot!